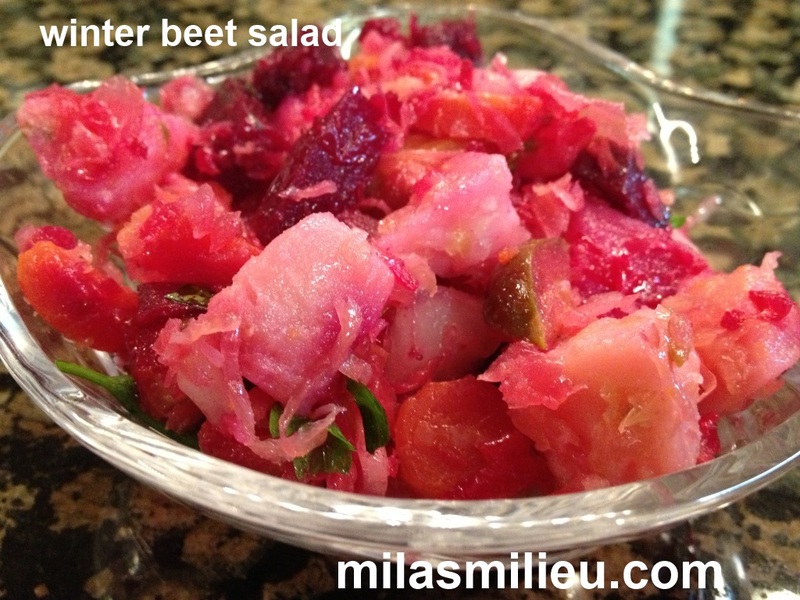 This beet salad is a nice break from heavy winter meals. It is filling but still on a lighter side. It was a staple growing up in Russia, especially in winter. Beets are commonly used in Russia, however not in the pickled/canned form. Once you try them fresh (baked or boiled), you’ll be asking yourself “where have they been all my life?” like my husband does. Update: my favorite way to prepare beets (easy!). And did you know that sauerkraut is a good source of vitamin C among other health benefits? I like the fact that this salad is very forgiving– the ratios of vegetables are flexible. As long as the vegetables are roughly equally represented, it will turn out fine! Place beets, potatoes and carrots in a pot, add water to cover, bring to a boil and simmer for 30 minutes. After the first 15 minutes of cooking time, remove the carrots to a plate (they cook faster than the rest of the veggies). After 30 minutes of cooking, check the beets and potatoes. If the knife comes in and out easily–they are done. Take them out of the pot and put on the same plate with carrots. Let them cool so you could dice them later. You can put them in the fridge till later, when you have time to finish the salad. Once your vegetables have cooled down, peel them by scraping the skins of. They come off easily at this point. Dice them in a half inch dice. Next, combine the diced vegetables, pickles, onion and peas/parsley. Season with salt, add the oil. I highly recommend using unrefined sunflower oil. Some grocery stores carry it, or you can find it online. You can serve it right away, or store in the refrigerator for up to three days. It gets better as it sits in the fridge. This salad makes perfect light lunch or dinner, add a boiled egg for protein.